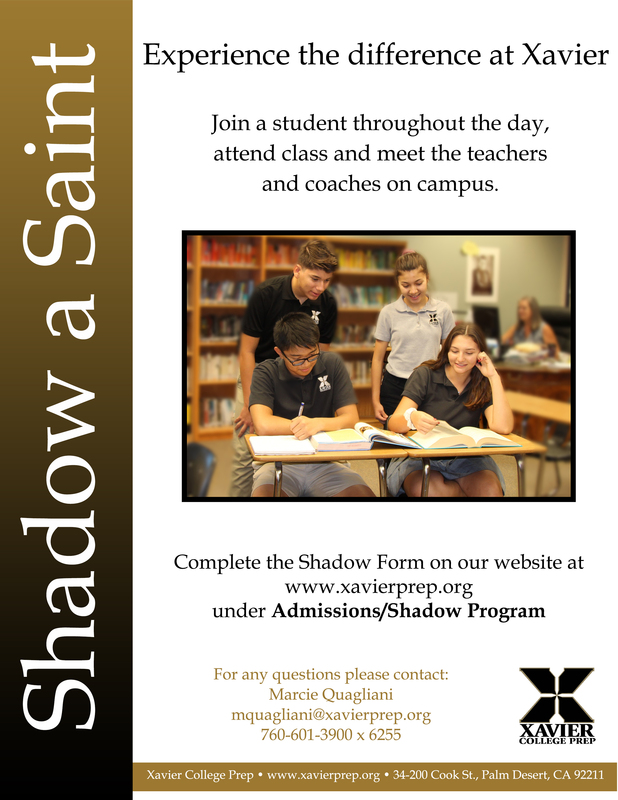 The Shadow Program offers all potential students an opportunity to visit Xavier College Preparatory High School to attend classes and meet teachers. Report to the Office at 7:45a.m. (school begins at 8:00 a.m.) Please note school begins on Wednesdays at 9:00 a.m. so please arrive at 8:45 a.m. Comply with the Xavier dress code: Boys wear a collared shirt, black or khaki slacks or shorts. Girls may wear a collared shirt with a skirt that falls to the knee in length or a collared shirt with black or khaki knee length shorts or pants. No denim jeans, sandals, or flip flops.